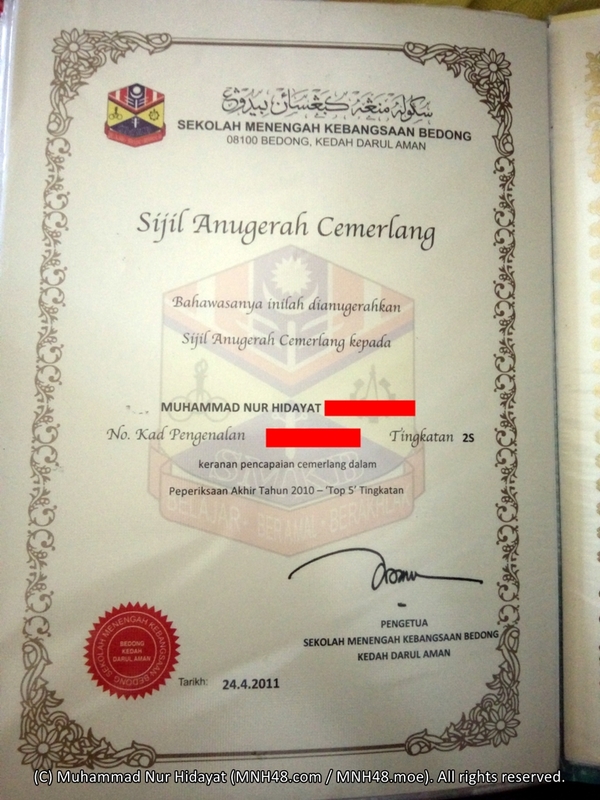 Secondary school (or known as "middle school" or "high school" in some countries) is known as sekolah menengah in Malay, carries meaning of "middle school". The years in secondary school are known as "form" , so form 1 corresponds to the 1st year of secondary school. 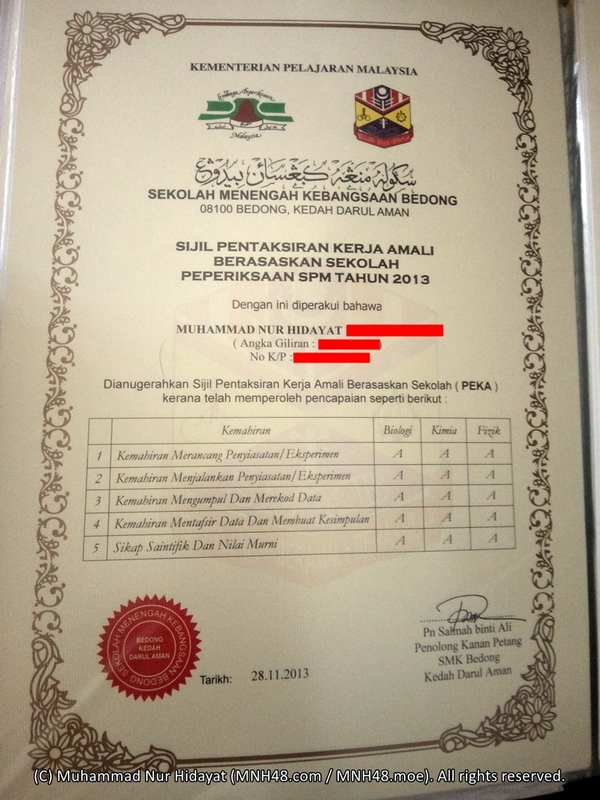 Secondary school has two separate category known as lower secondary (menengah rendah) consisting form 1 to form 3 and upper secondary (menengah atas) consisting form 4 and form 5. 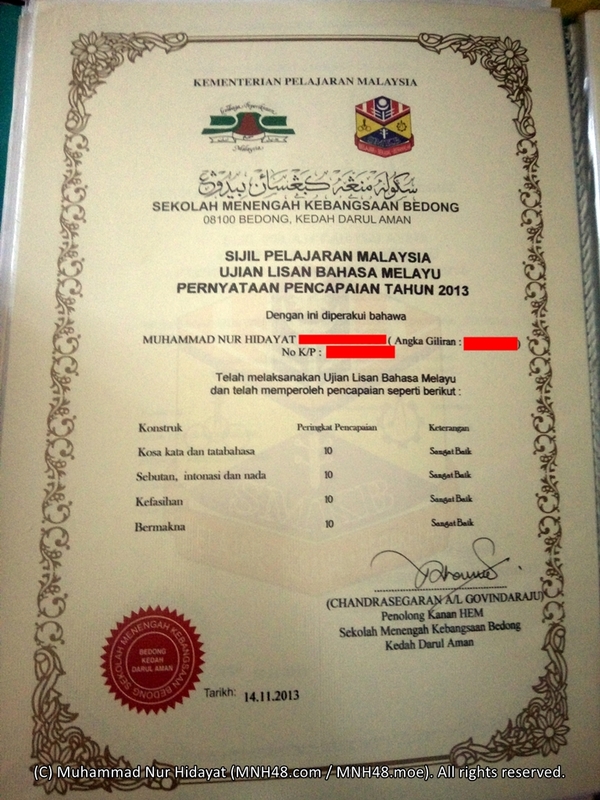 Certain secondary schools (including mine) also has another category known as pre-university (pra-universiti) consisting form 6 lower and form 6 upper. In our school's case, they have separate buildings far from the rest of school. 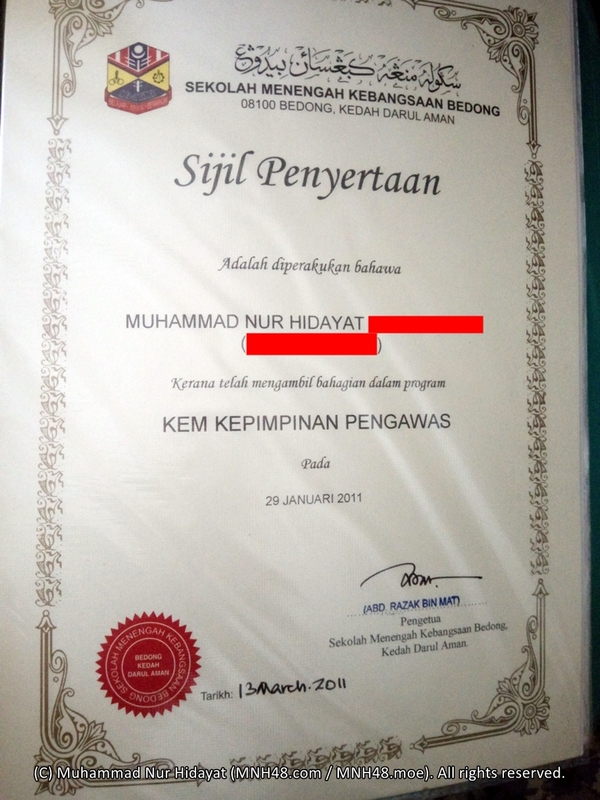 In 2009, at the age of 12, I was admitted to form 1. 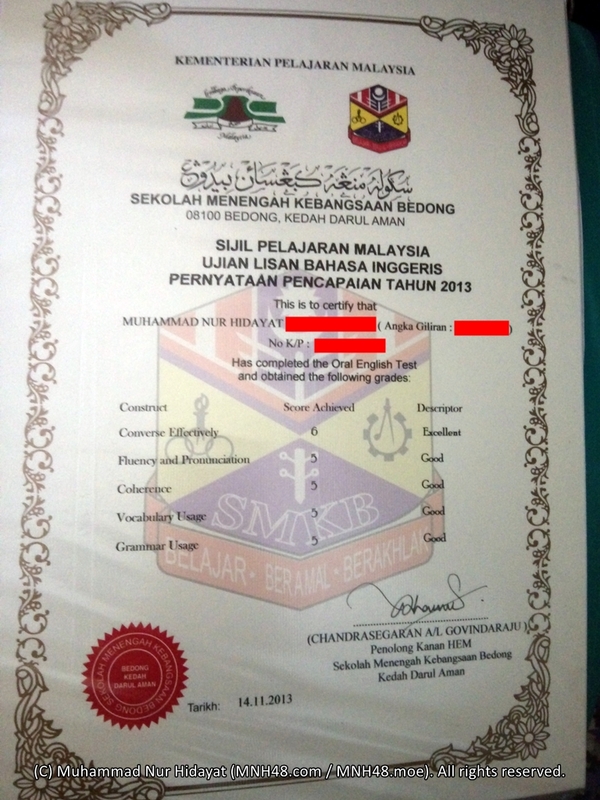 Different from primary school, the secondary school I attended, SMK Bedong, Kedah (吉打州美农中学) is not a Chinese school. 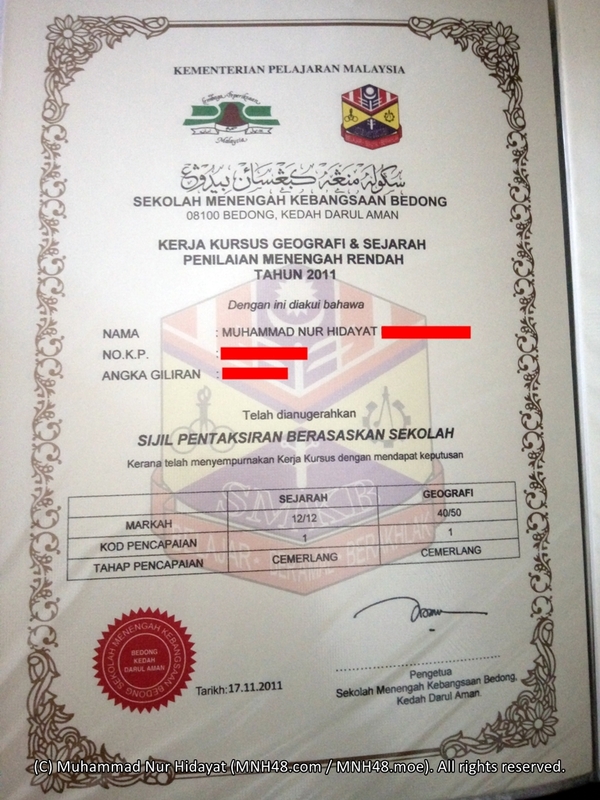 Instead, it is a normal national secondary school which uses Malay as the main language. Google Street View of SMK Bedong. Actually, I applied for Chinese secondary school, but it was not approved because the requested school is too far from my area (more than 15km), even though it is already the nearest Chinese secondary school in the region. 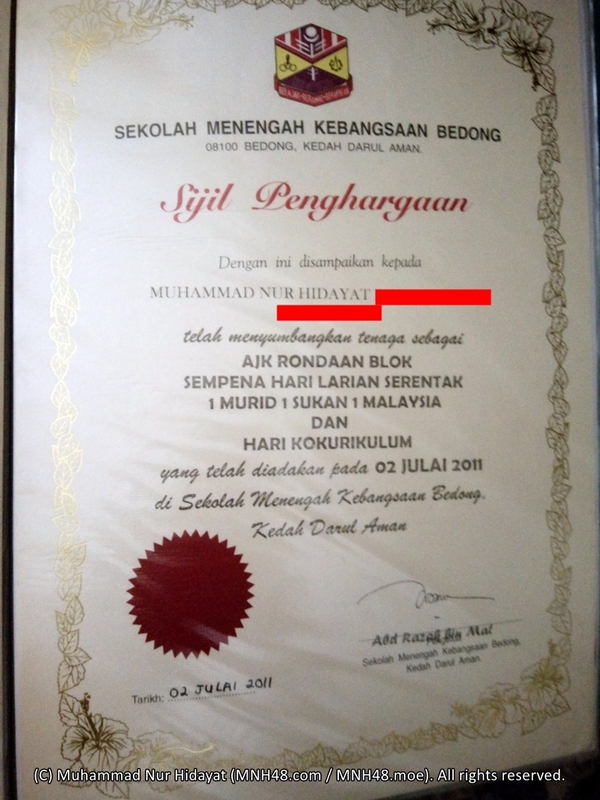 My name was then appeared in list for SMK Amanjaya as it is the secondary school in my own area with distance of only 1km. However, I've contacted the education department and successfully reallocated myself to SMK Bedong in the neighbouring town, Bedong which is 5km away. I avoided SMK Amanjaya because of the fact that SMK Amanjaya is too crowded, with 1 class consisting 40 to 45 students, and there are total of 17 classes for each form in lower secondary. The classes for form 1, for example, are divided to 3 special programme classes (1RK1, 1RK2, 1RK3) and 14 normal classes (1A, 1B, 1C, 1D, 1E, 1F, 1G, 1H, 1I, 1J, 1K, 1L, 1M, 1N). This is true at that time, I don't know how it is now. In SMK Bedong, it is also crowded but not as crowded as SMK Amanjaya. We have 1 special class which I get into, called 1Super consisting 35 students, and 9 normal classes, 1A, 1B, 1C, 1D, 1E, 1F, 1G, 1H and 1I, which most of the classes having 38 students. I was able to request to take Chinese in the school. However, I could not attend the class as it was held on the same time as halves of the Islam Education classes. I was left with self-learning, but I was provided with the textbook. In SMK Bedong, we have two sessions of classes due to fact that the classrooms available could not cater the amount of students. The morning session is for form 3 to form 6 whereas the afternoon session is for form 1 and form 2. We're not allowed to leave behind anything as the classroom will be used by other classes from different session. Do note that schooldays in Kedah (and Kelantan) starts on Sunday and ends on Thursday. I don't have a copy of timetable from form 1. When I first entered, I get to be cooperation (school book store) custodian, or known in Malay as Pengawas Koperasi, literally "Cooperation Prefect". I help the cooperation / book store teachers to count on the stocks, help them sell the stationeries, books and snacks, count the profits gained on our duty time, among others. 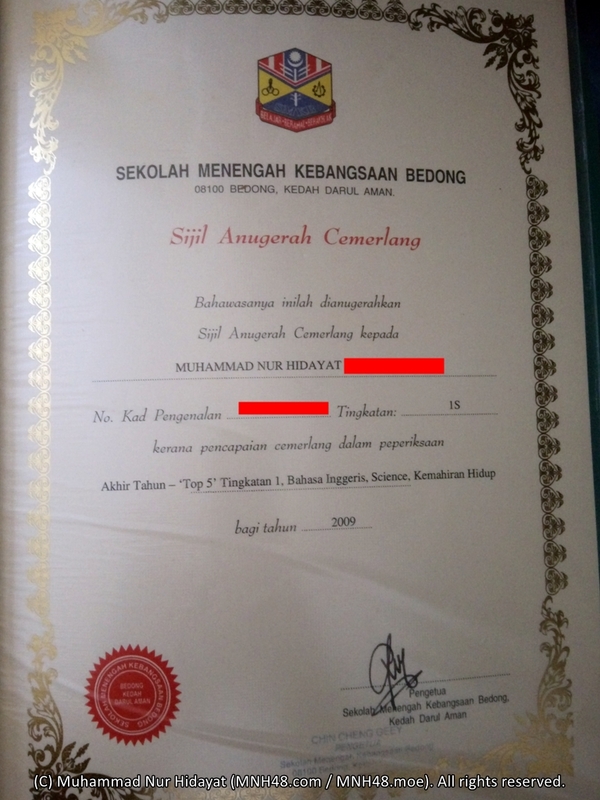 My first year in secondary school ended with me being in the top 5 students and I got the highest mark for three subjects among all form 1 students: English, Science and Living Skills. The actual form 2 timetable I made to put in my stationery box. I have rewritten the timetable of my class during form 2 in English at here. 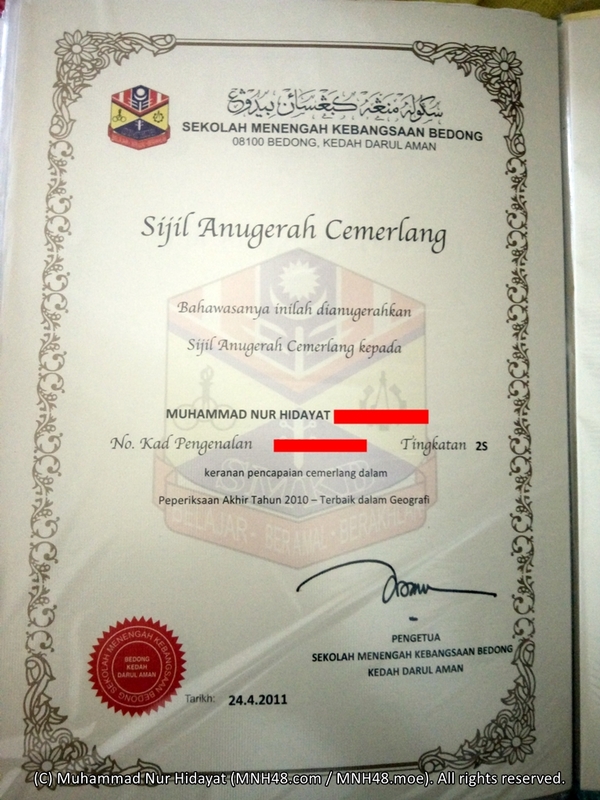 During form 2, I became a part of librarian, or known in Malay as Pengawas Pusat Sumber which literally means Sources Centre Prefect. I came to school earlier than others and stay at library during recess time following library schedule, I do clear up all books from the return baskets, key-in new books, checks for students borrowing and returning their books, among others. Regardless, I still get into top 5 students at the end of the year, and got highest score for two subjects: English and Geography. This was also the year I get to go Kuala Lumpur and Melaka for the first time under the programme "Jejak Warisan Merdeka", I might do separate blog post about it later. 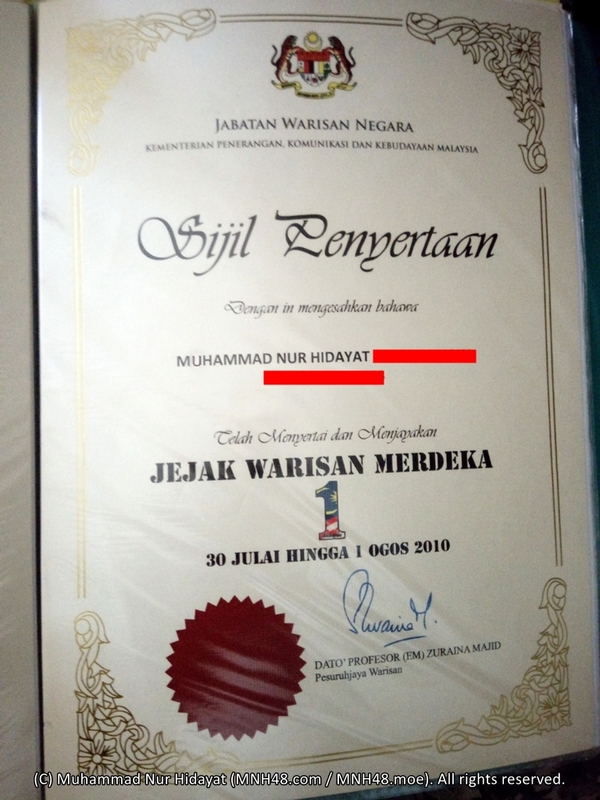 Certificate for participating programme "Jejak Warisan Merdeka"
I have rewritten the timetable of my class during form 3 in English at here. In form 3, all students are busy preparing for the second national examination, which is called Lower Secondary Assessment or Penilaian Menengah Rendah (PMR). 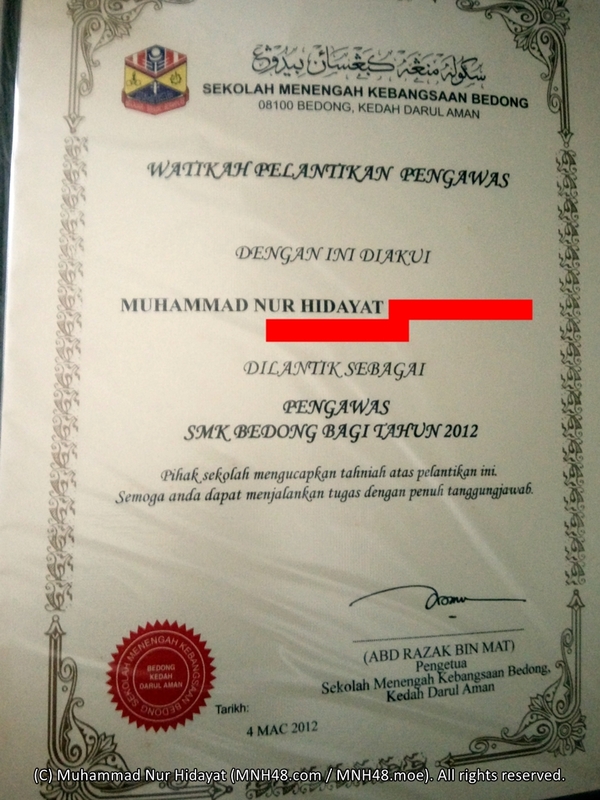 On the other hand, I applied to be a full proper school prefect, known in Malay as Pengawas Sekolah. 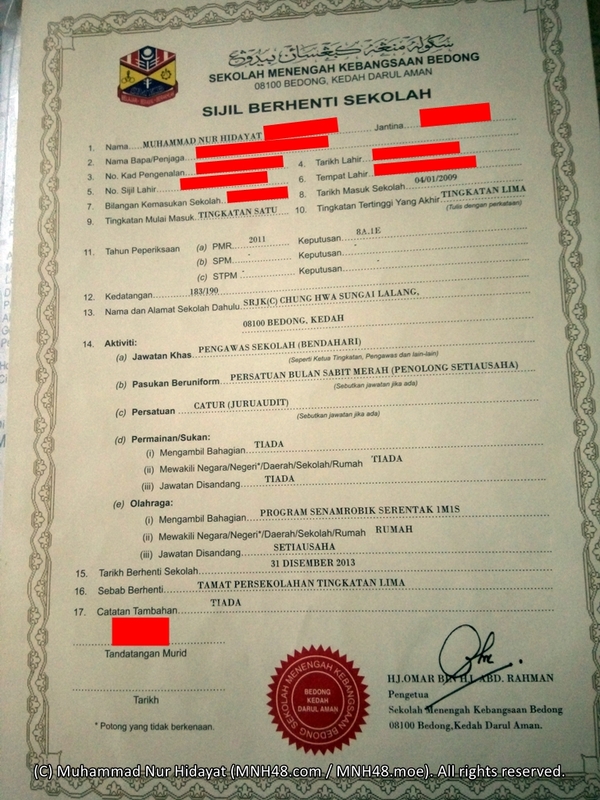 My application is approved on first try because I was in the first class and had fairly good academic, and we had a preparation camp and trial period before appointed to be a full school prefect. 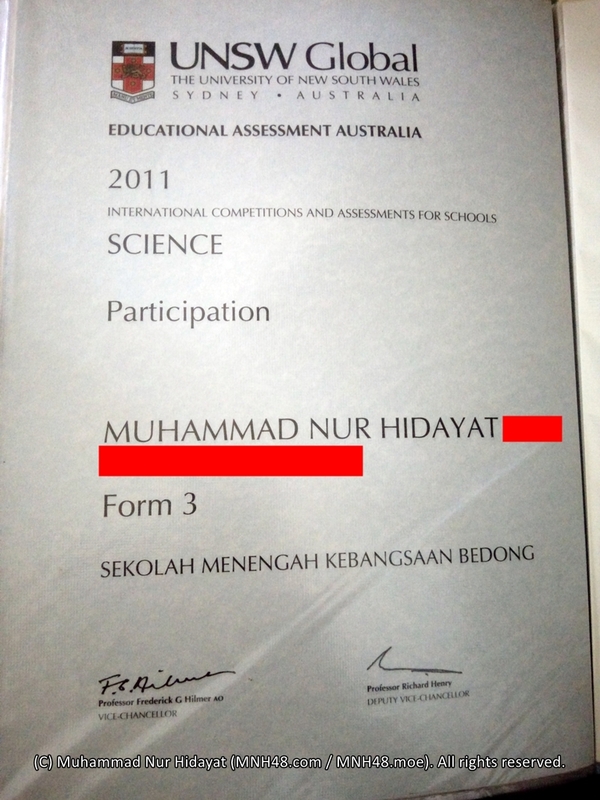 My friends and I also enrolled in International Competitions and Assessments for Schools for Science subject under advisory of our Science teacher, and the questions are very hard, but we still get participation certificate anyway. During open campus day, I and a few other selected prefects formed committee to patrol the classroom blocks and we got certificate for that as well. It's mainly to control the students and the guests so they don't enter prohibited zones on the day. Nearing the PMR, the school sent us who are in the first class to attend PMR preparation camp. 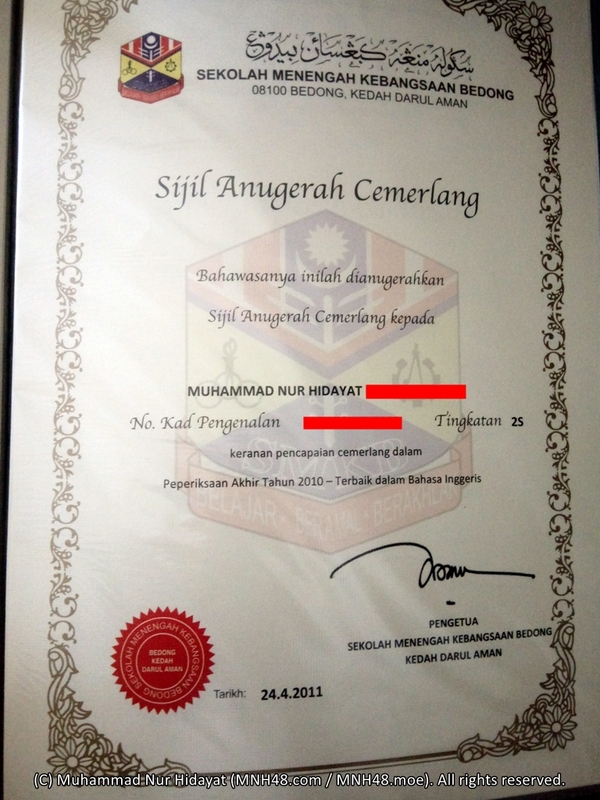 It means more certificate, but the main point is to get ready for PMR. 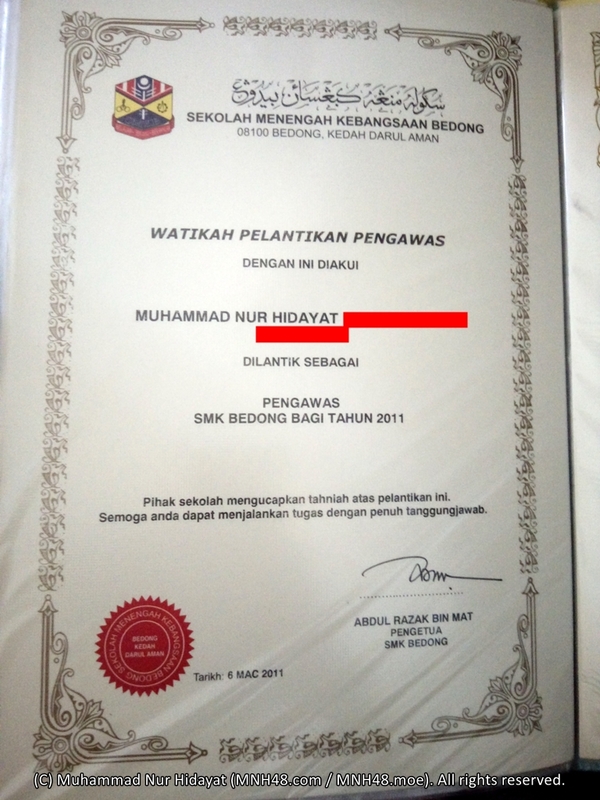 I then sat PMR taking 9 subjects: Malay, English, Mathematics, Science, Integrated Living Skills, Geography, History, Islam Education and Chinese. 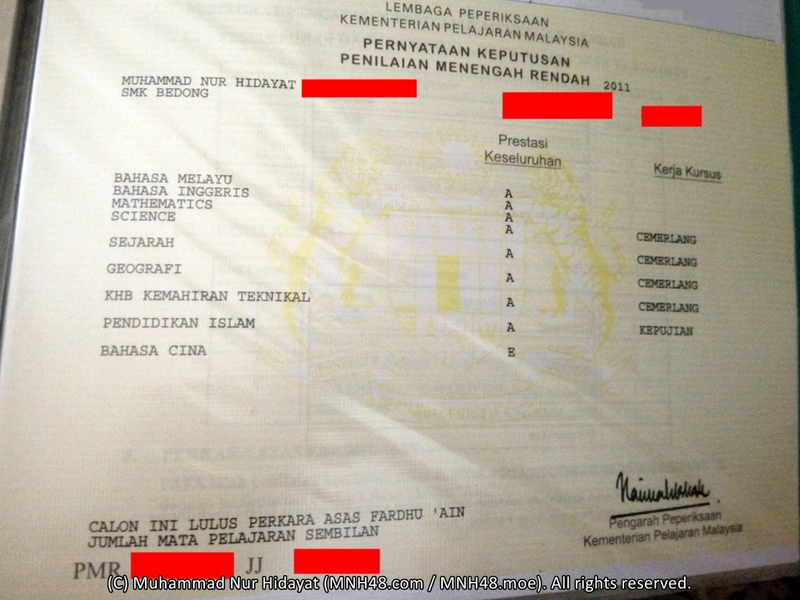 I get As for all subjects except Chinese where I failed the subject. It was kind of expected because I could not attend the classes, and 90% of native Chinese students in my school which did attend class also failed it. 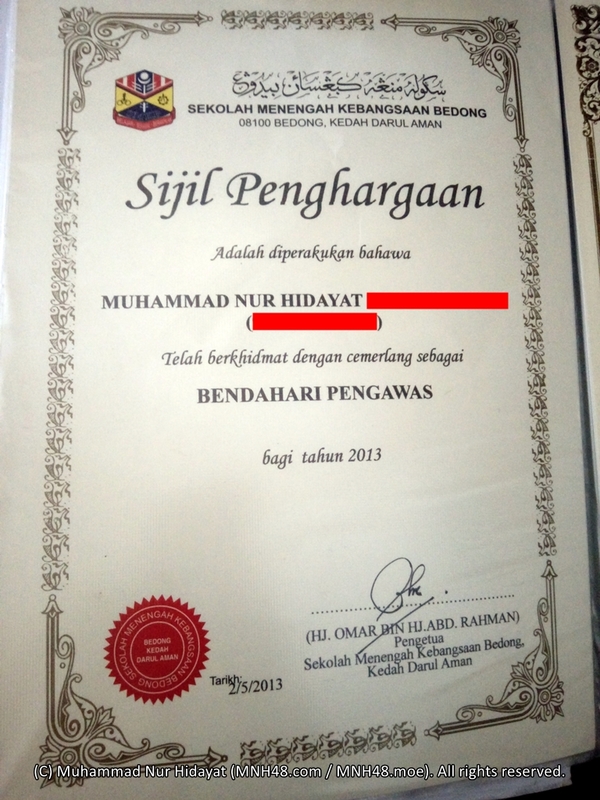 On the time I write this, a new national examination has replaced PMR, the new examination is called Form 3 Evaluation or in Malay, Pentaksiran Tingkatan 3 (PT3). 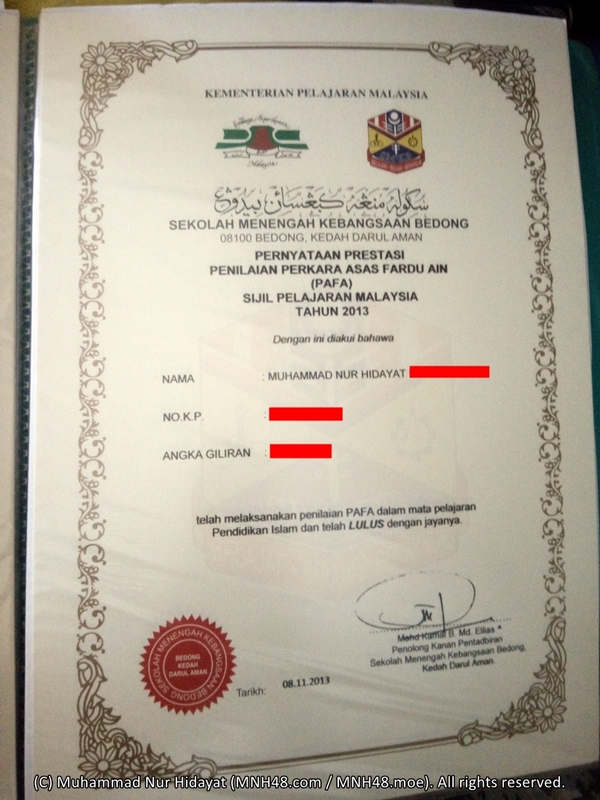 After PMR results were out, some students would change to other schools such as the residential schools known as "Science School" which only takes people with high achievement. I was actually eligible even though I failed in Chinese because the subject is not a part of their requirement, but I chose to stay in the same school as I will need to work harder in those kind of schools, unlike me who wanted to do everything at my own pace. 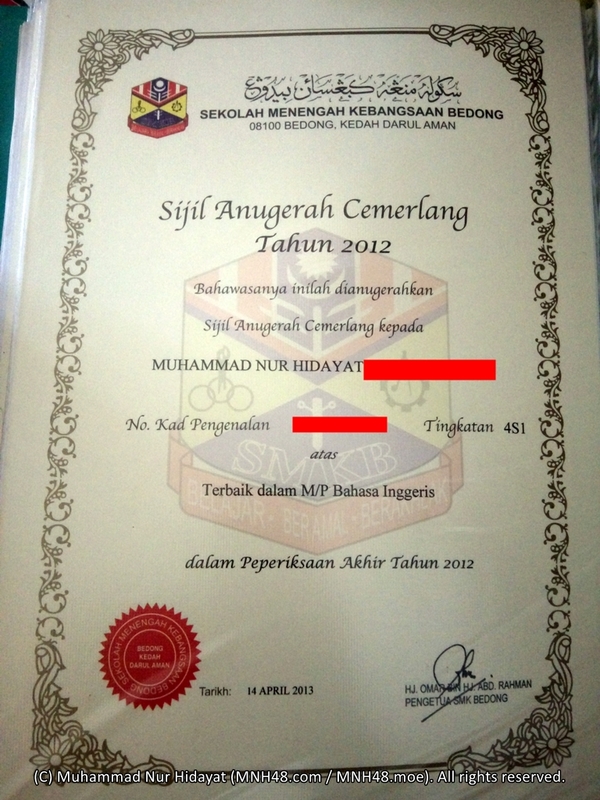 Other than PMR certificate, we also got other assessment certificates that were given the same time as the PMR certificate itself. Apparently, the school is continuously assessing the students without we knowing it. 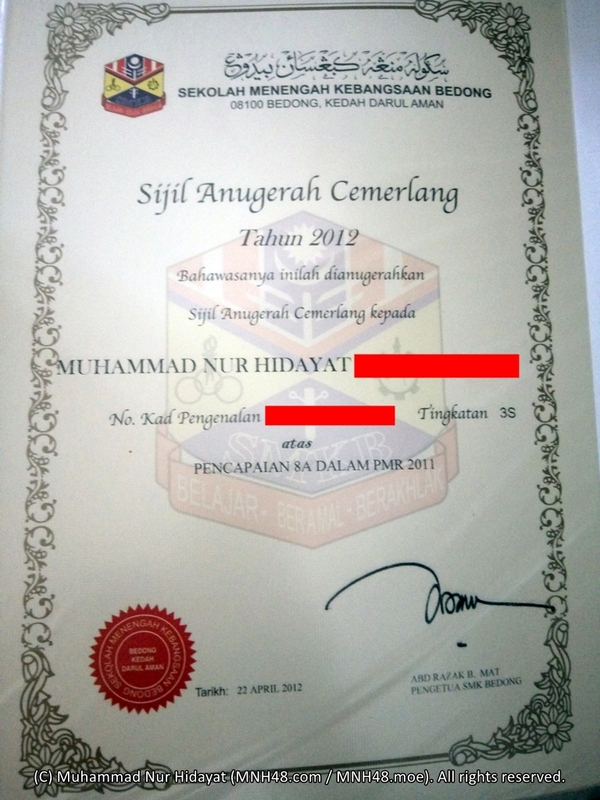 We got the certificate for the Islam Study (PAFA), History folio, Geography folio, Science (PEKA), language and another certificate for number of As we got in PMR. Continuing the school, they gave students some time to apply for the streams because there are three streams of form 4, science stream, art stream and vocational stream which do have differences in subjects taken. The teacher then check for students qualifications and assign us to classes based on what we applied for. I get the class I want, 4Sc1 which is in the science stream. There are only 2 classes in science stream, with difference in that 4Sc1 takes Biology whereas 4Sc2 takes Accounting. Both classes takes Chemistry and Physics, you can't run from Physics if you take science stream in my school, unlike some other school which allow you to choose between Biology and Physics. The art streams has classes 4A1, 4A2, 4B, 4C and 4D, which I don't know what are their differences other than students in 4A1 and 4A2 need to take accounting. The vocational stream only has 1 class called 4MPV. You will be in the same class when you get to form 5, you would not suddenly jump from 4Sc2 to 5Sc1 as there are differences in subjects taken. 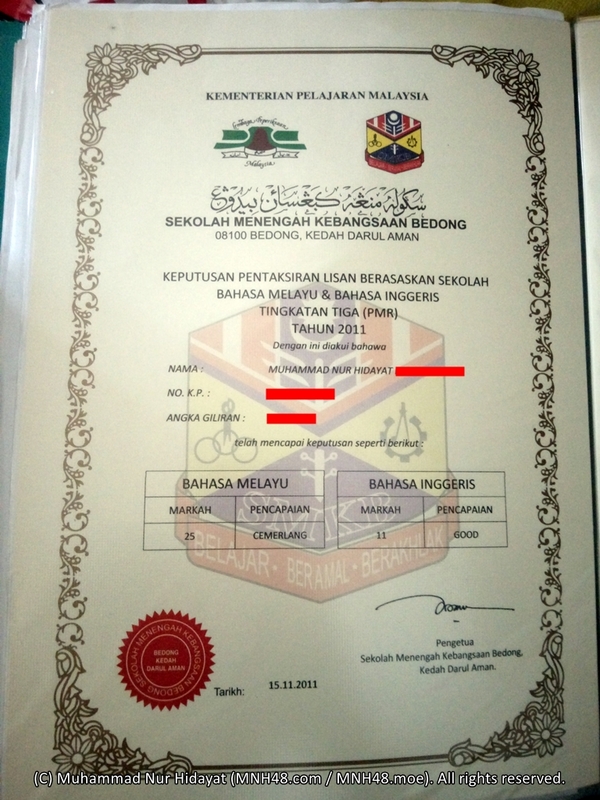 The year I was in form 4, 2012 is also the year where the previous programme of "The Teaching and Learning of Science and Mathematics in English" or known in Malay as Pengajaran dan Pembelajaran Sains dan Matematik dalam bahasa Inggeris (PPSMI) being phased out to be cancelled. Because of that, the Mathematics and Science subjects are slowly being changed from English to Malay and teachers need to choose which version works the best for the class. In my school, they ask the students in class on whether they want it in English or Malay. 4Sc1 has majority voted in English whereas 4Sc2 has majority voted in Malay, thus making teachers teach the subjects in English for our class and Malay in the neighbouring class. Since there are like more than 50 subjects available nationwide for upper secondary level, I can't list all of them here. I don't even know what subjects are taken by those outside of science stream when I was in the class. I'll just be listing subjects taken by science stream students in my school. Other schools may have more or less subjects taken, or maybe a completely new syllabus is being used now as times passed. The actual form 4 timetable I made to put in my stationery box. I have rewritten the timetable of my class during form 4 in English at here. In form 4, it's all new environment because students just focus on their class and don't need to aim for other classes since you'll still be in same class for form 5 the next year. 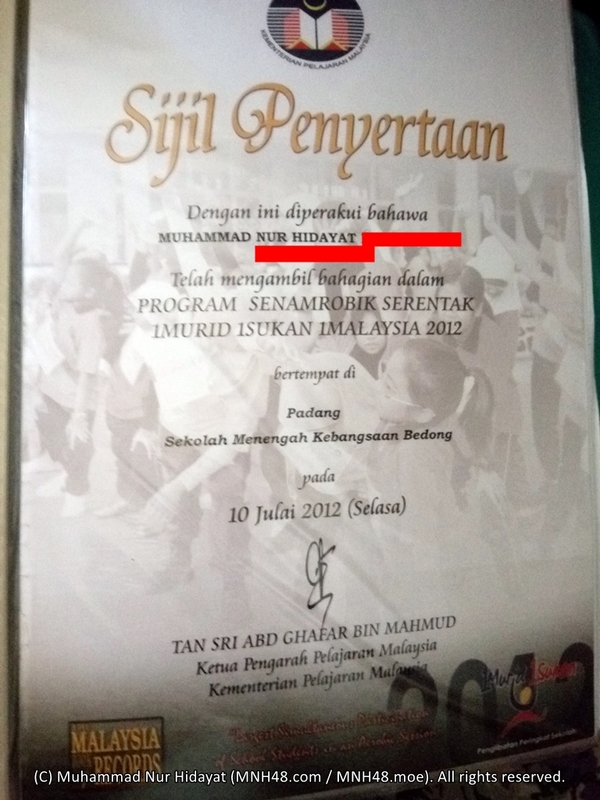 The same year, our Ministry of Education organized simultaneous aerobics programme "1Murid 1Sukan 1Malaysia" where all students nationwide would gather on the school field to do aerobics on the exact same time, and we get certificate for that. 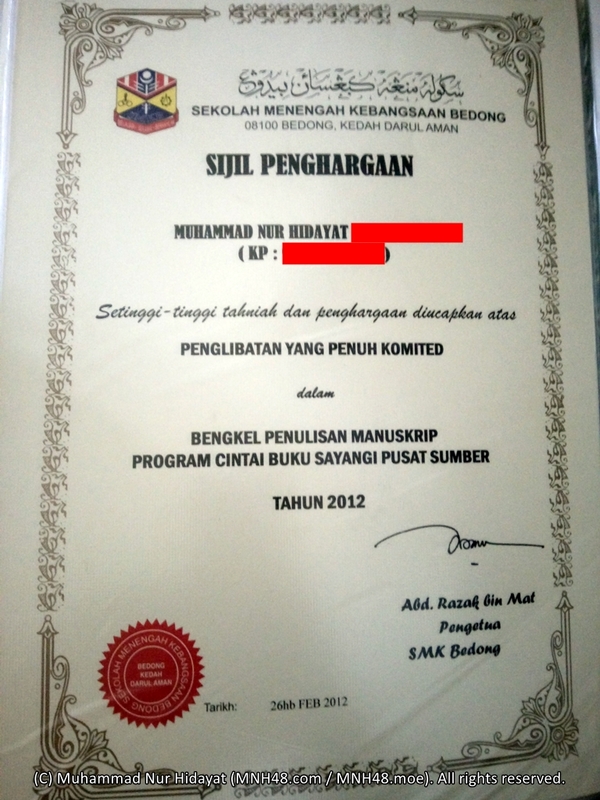 Later on, under advise of our Malay language teacher, I joined the manuscript writing workshop (and got certificate for it as well). The workshop is mainly about the proper way to prepare manuscript for publishing. 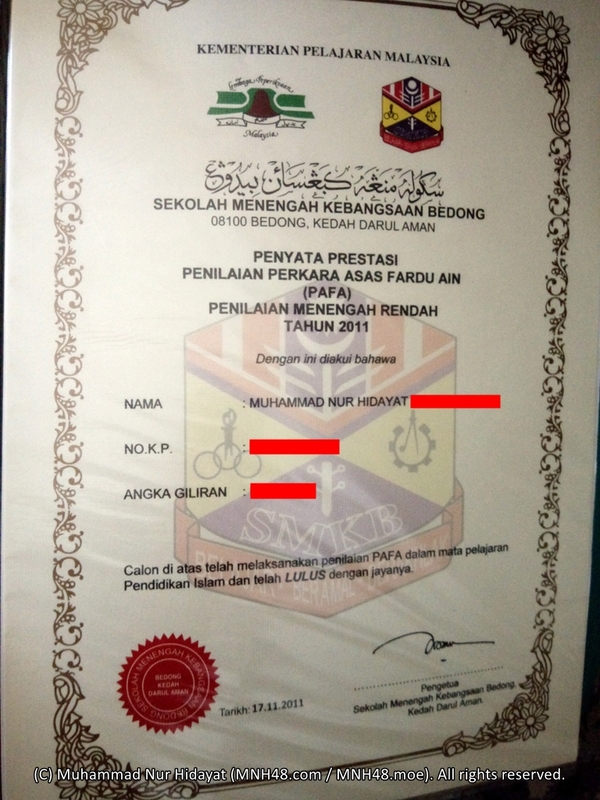 I still continue my duty as school prefect from the previous year since it's renewed automatically, but I got separate certificate for the appointment of school prefect for that year. One thing why students would like to be school prefect is because they can usually go out for recess earlier than other students since they'll be on duty during the recess time. Also the fact that prefect has higher power than class monitor and other kinds of prefects (like librarian or cooperation custodian). In this year, selected students including me were sent for a field trip to Alor Setar to gain experience and knowledge. There were four places we have visited on the field trip: the Northern Territory Branch of National Science Centre, the Paddy Museum, Kedah State Museum, and Alor Setar Tower. 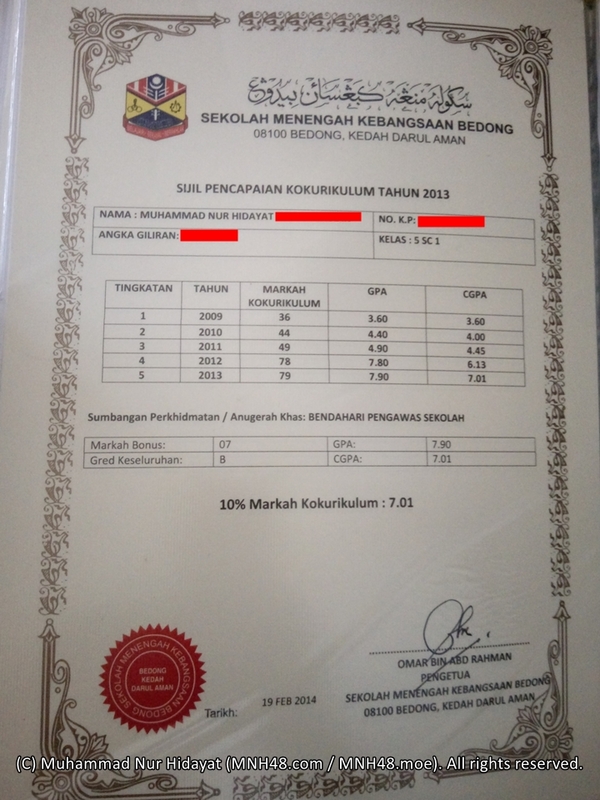 At the end of the year, I got the highest score in the final examination for English subject, and I got certificate for it as well. The actual form 5 timetable that I made to put in my stationery box. I've rewritten the timetable of my class during form 5 in English at here. 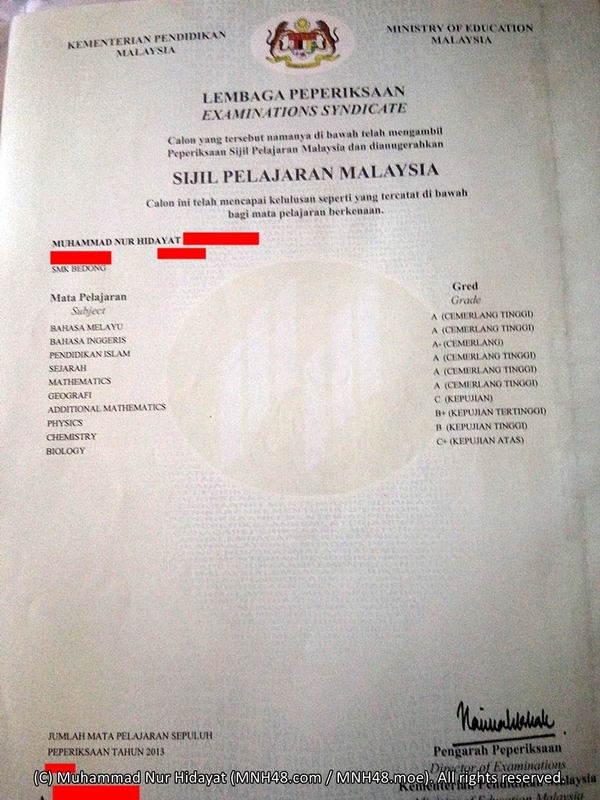 When we get to form 5 in 2013, it's time for students to prepare for the third national examination, which is called Malaysian Certificate of Education or Sijil Pelajaran Malaysia (SPM). Meanwhile, the meeting between the school prefects and teachers agreed to appoint me as the school prefect treasurer, who collects the monthly prefect fee that is used for annual prefect dinner, and other kinds of fees when needed. In addition to my usual duty, I could go around the whole school to hunt on the school prefects who don't pay for the fee and reports them to the teacher after I issued a few warnings. I was also the first school prefect treasurer who actually put up list of school prefects who don't pay their fees on public notice board that was reserved for school prefects, just beside the main staircase to principal office, and noticeable from the place where we had morning formal assembly or homeroom assembly. Our new principal on that year was a very Islamic person, so he started out to make a mandatory Yasin recital for all muslims on every morning except Sunday (where formal assembly took place) and Tuesday (where uniformed assembly took place). Every muslim students will gather in one hall, and one of students will lead the recital. It is believed that if we recites Yasin at the beginning of the day, our needs for that day will be fulfilled. Non-muslims on the other hand has the normal homeroom assembly separate from the muslims when the muslims are reciting Yasin, though they also added in some religious information (sayings from Hindu and Buddha) in the assembly to make it on-par with the muslim's recital. However, as I was school prefect, I usually didn't participate the Yasin recital as I had duty at other places of the school, mainly waiting at the gate to catch late students. 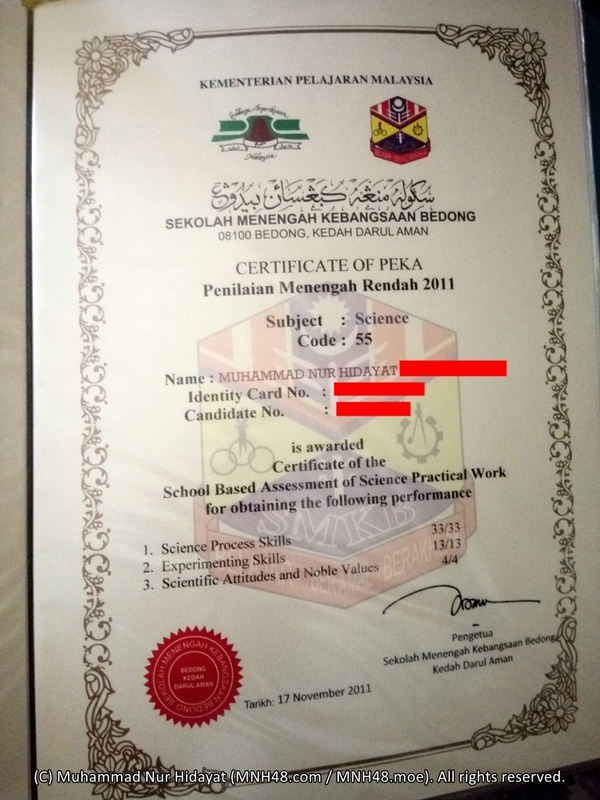 Even though we're all busy preparing for SPM, we also ensured to take part in as many activities and positions as possible to fill up our co-curricular record book, so that we have high marks for co-curricular, because the teacher always told us that it is very important and people will look at it when we're going to find jobs after graduating. I became the secretary of our sports house named Syahbandar, bearing the colour of purple. As the secretary, I help the teacher and the team leader in carry out the plans for the sports day and other sports activities. Other than that, I also hold position of vice secretary for our uniformed organization, the Malaysian Red Crescent Society (PBSM) in our school. For most sports events, after I finished helping with the sports house, I'll run to the PBSM site and get ready for any possibility that might happened on the events. We treat people who fall sick, and we also has a teacher and a trained individual standby with ambulance in case we need them. As for clubs, I was appointed as the internal auditor for the chess club, performing checks on the activities and ensure that all the chess sets and clocks are properly stored without any missing pieces, and also checks on the accounting book to ensure the money spent were exactly as recorded, and report to the teacher if there's suspicious or mismatch. 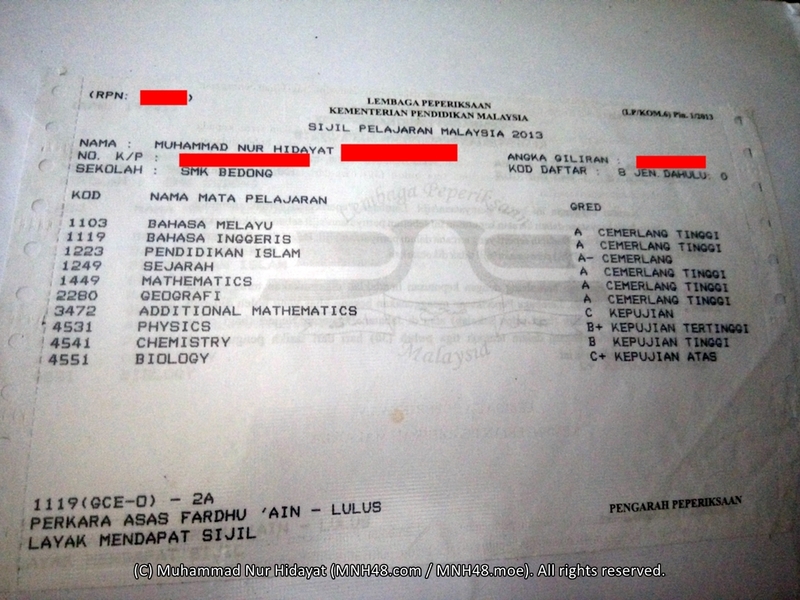 At the end of the year, I sat for SPM taking 10 subjects: Malay, English, Modern Mathematics, Additional Mathematics, Biology, Physics, Chemistry, Geography, History, and Islam Education. I get 6A2B2C on this examination as noted below. On the time I write this, there has been changes in the syllabus used for SPM. 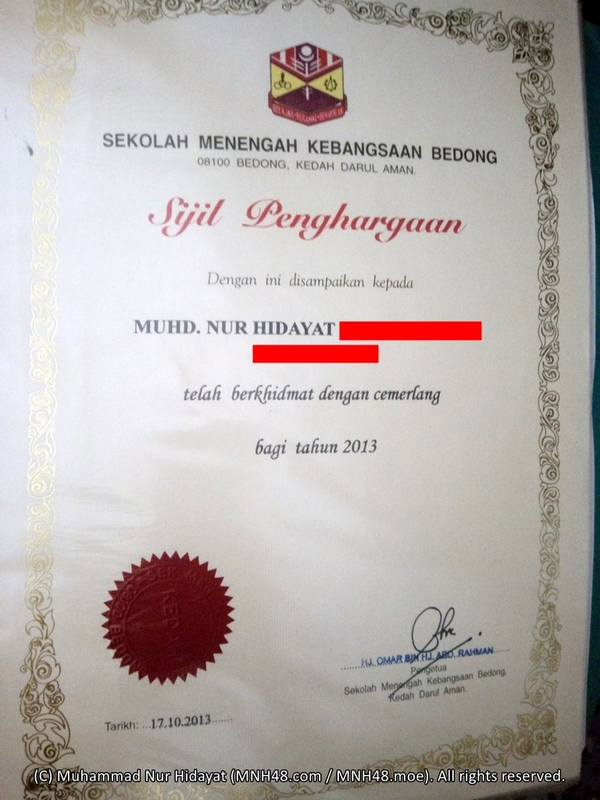 On the time I receive the SPM result slip, I also received a few certificates for the co-curricular activities that I had attended since form 1, for the Islam Study (PAFA), for the science assessments across Physics, Biology and Chemistry (PEKA), for English oral test, for Malay oral test, and my graduation certificate. 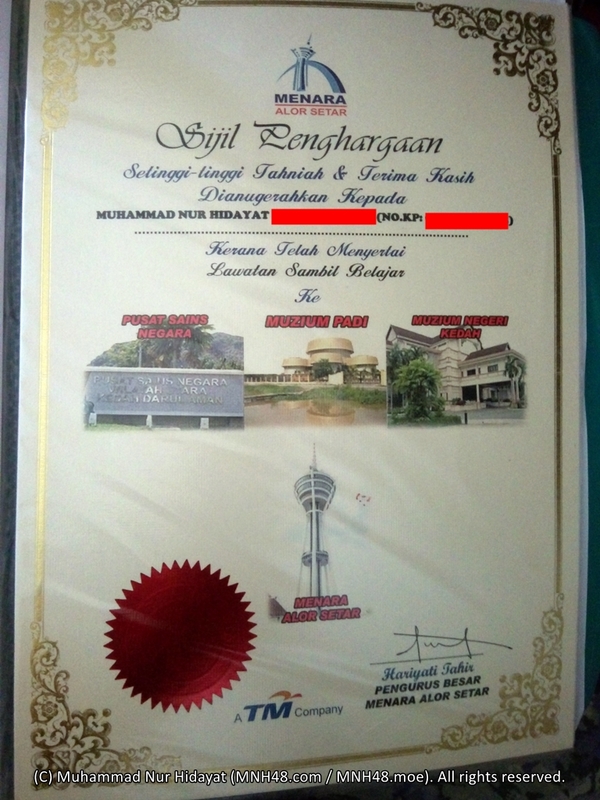 After a few months, I get to claim the formal finalized official SPM certificate that was sent from the main office of Ministry of Education. 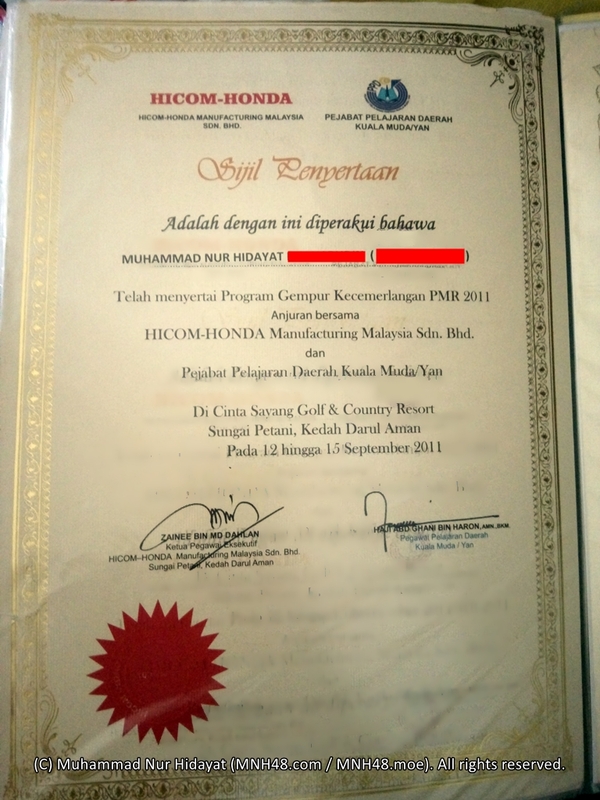 This formal certificate is the one people use for entry to university or to find jobs.